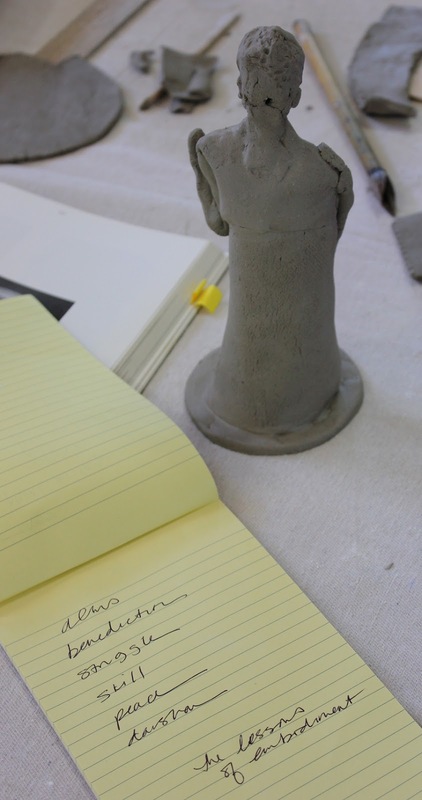 I've been working on a series of small gestural rough pieces in a heavy, groggy stoneware. I'm used to hand building with porcelain or fine white stoneware which are smooth and delicate to the hand. This stuff is rough and earthy. I'm used to planning and measuring and carefully cutting from templates, and with these pieces I'm rolling out uneven surfaces, spontaneously tearing the clay, working by feel, being guided by the process itself. 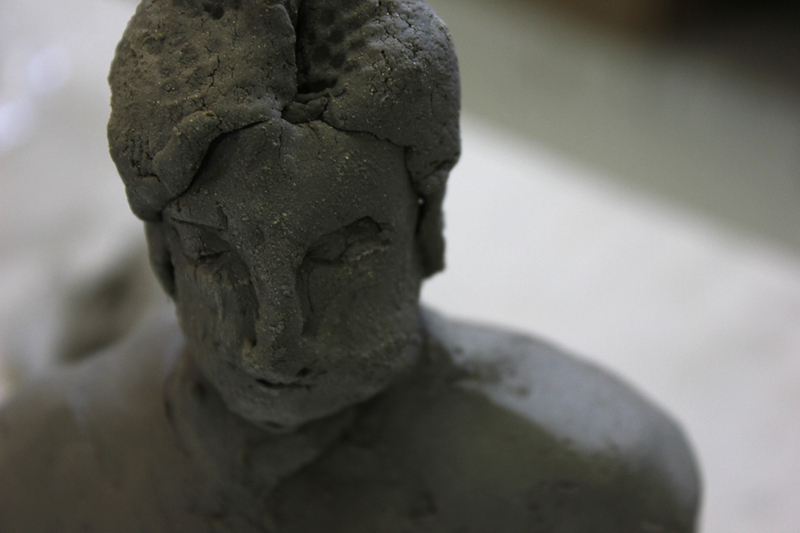 What I'm finding is that this rough clay is the perfect vehicle for expressing the questions of embodiment. Some would argue that buddhism is a religion of transcendence but I don't believe it is. We embrace the paradox of embodiment and the lessons of the body. As the Buddha himself discovered, asceticism and mortification are not in themselves paths to enlightenment. We can learn to manage desire and impulse with skill and compassion, never needing to denigrate the body or set up an antagonistic body/spirit dualism. Still, there are questions, problems, paradoxes, ironies, difficulties. The life of the body is rich with them. From where else should we draw our questions, and so our wisdom, our knowledge of the spirit? wisdom-breakthrough - in this body, in this life, in this ordinary, imperfect human form. There are a few moments of Buddha's life which we see over and over again in the iconography. Seated Buddha in meditation on the night of his enlightenment under the Bodhi tree. Standing Buddha, the young priest offering a gesture of benediction, abhaya, no fear. Reclining Buddha, approaching his death, offering reassurance to his followers. Each of us has great moments in our lives, moments of enlightenment, benediction, and release. And these moments are the sum of all preceding moments, and how can we say which moments are most sacred? What I find emerging from beneath my hands in these small sculptures are articulations of very human moments in the life of the Buddha. Not the iconic moments but the ordinary moments of weakness and struggle, pride and suffering. A caved-in chest and an alms bowl. A proud young prince playing with priestly gestures. My hands imagine the many moments of this remarkable human life, the multitude of human moments ultimately consummated beneath the Bodhi tree. In creating these pieces I do feel in communion with the wisdom-body of the Buddha. This sounds grand but it is ordinary and intimate. Of course it is intimacy with the universal human experience of embodiment, suffering, and the possibilty of enlightenment. That's it for today. 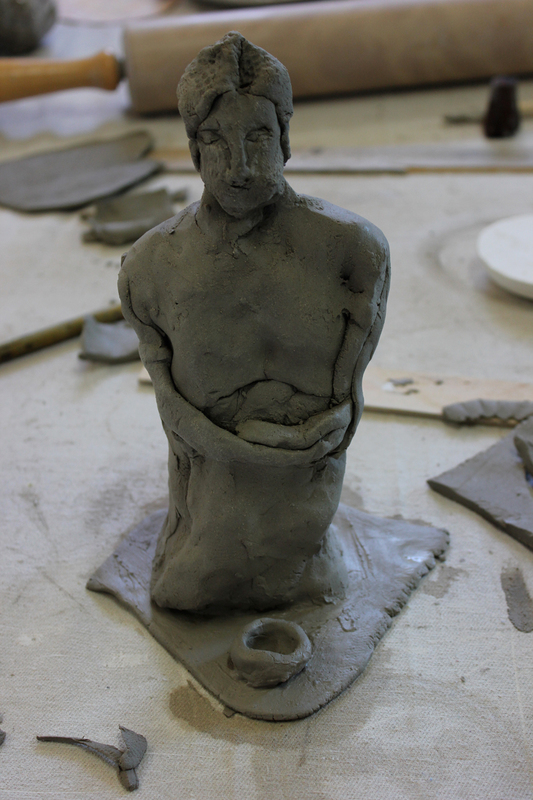 I hope you enjoy seeing these clay pieces in progress, and I would love to hear what thoughts and feelings these pieces inspire in you. Bronwyn, as always I enjoy you sharing your thoughts, reflections and inspirations as you journey along with the many Buddhas you are manifesting. I resonate with your view of Buddhism being less about transcendence, and more about "marrying" the dual nature of human existence. I do however have a qualm about the dual nature of the Buddha himself, that I have yet to come to peace with. As I read your listing of the human moments of the Buddha's life there is one moment that is glaringly missing. I find that same moment is usually missing from discussions about the Buddha. In order for the Buddha to have the time/space to search for enlightenment he first had to abandon his family. Sidhartha left his wife, his young child and his "manly" responsibilities so that he could sit under the Bhodi tree. As a woman and a mother, I feel left out of Buddhism by this unspoken fact. Where is the analysis and recognition that he had the time/space to seek enlightenment, only because a woman took on the greater burden to raise their child as a single mother? I don't expect you to have the answer to my own deep questions (quest?) about this, but I do need to speak out about it. Please, let us see the whole picture (with all of its ugliness) and try to come to peace with that.